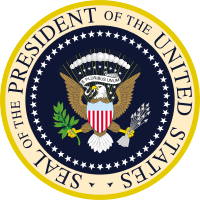 There are now less than 100 days until the next presidential election in the United States. The party conventions have come and gone, yet there is still no clear perception on how either candidate is going to return growth to the American economy. President Barack Obama may be the first regular tenured president to not have a single year where growth exceeded 3%. If this decade long interruption in normal growth rates is not reversed, the United States will soon experience a fundamental change. If the dismal rate in GDP (Gross Domestic Product) expansion does not alter, the social contract between the young and old will necessarily collapse. Economic growth is necessary to fund entitlements across all social classes. The gap in future financing for Social Security, Medicare and Medicaid alone is widening at an alarming rate. The American economy continues to limp along at an annual 1% growth rate in 2016. This remains the worst economic recovery since 1949. It does not even keep pace with population growth. If one subtracts government deficit spending from the GDP, there is no growth at all this year. The national debt already exceeds $19.3 trillion USD (United States Dollar). It was $10.6 trillion USD at the end of the Bush Administration. There has been more deficit spending in the subsequent years than in any other time in American history. Annual deficits exceeded $1 trillion USD in the fiscal years of 2010-2012 and 2014. 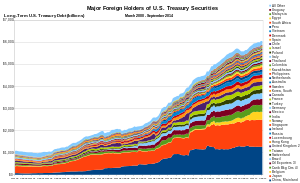 These were accumulated in years, when the Great Recession had already supposedly ended. The total accumulated debt is 105% of GDP and equal to $154,344 USD for every American household. The budget deficit has since dropped, but still is hundreds of billions in the red every year and is due to rise again, as the cost of entitlements and interest on the national debt take an ever larger share of total expenditures. Soon the interest on the debt, will be the third largest outlay in the federal budget. Even with the most optimistic economic scenarios, the present rate of government spending is totally unsustainable. This is the reality that the citizenry of the United States has not been able to fully comprehend, because the issue has not yet transcended the struggle between the two main political parties. If one were to subtract the assets available to the federal government, the unfunded liabilities at the end of 2015 were already at $76.4 trillion USD. This is a burden of $613,531 USD for every household in the country. The shortfall would take 90% of combined net worth of all households including assets from real estate holdings, stocks, private businesses and durable consumer goods. Regardless of the rising tide in debt, the Democratic nominee Hillary Clinton is now promising a fully new middle class entitlement. Free college tuition when student debt is already approaching $1.4 trillion USD, will be another burden on an already overextended national government. The 2010 federal takeover of the student loan program, has shifted the liability of this debt to the taxpayers. 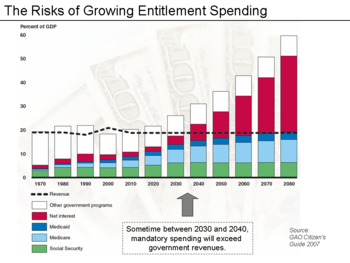 What many supporters of further government involvement refuse to acknowledge is that the more subsides that are provided, the faster the increase in the entitlement spending. Education costs alone are expanding by an annual rate of 6%. Mrs. Clinton is also wanting to build on expanding what has become known as Obama Care. Costs are escalating and consumer choice is narrowing, as providers continue to exit the exchanges. The Obama Administration acknowledges a 8% increase in costs for 2016, which is already three times the rate of inflation. However in many states, premium hikes for insurance are in double digits or even higher. There are many in the Democratic Party that insist the answer to rapidly rising medical costs, is a complete federal take over of the healthcare industry. This would have the government absorb nearly 20% of the overall economy. The huge new bureaucracy once created, most likely would follow the model already in place. It is called the Veterans Administration. Mrs. Clinton is also looking at creating a new $275 billion USD infrastructure investment program using taxpayer funds. How this will differ from the $832 billion USD stimulus that was passed in 2009 as the Recovery Act, is still not clear. The latter also had substantial funds that were to be devoted to infrastructure. As it turned out only 10% of the total, actually went towards projects that included roads, bridges, and similar undertakings. The Democratic nominee insists that the new proposal will be the largest investment in infrastructure since the end of World War II. How she will prevent the fraud, waste and misappropriation of funds that accompanied the Recovery Act remains a mystery. There are many that insist the new endeavor is simply a doubling down of the existing policy under President Obama. To pay for these initiatives, Mrs. Clinton says she will increase taxes on the wealthy. That taking an ever greater share from the class that provides the lion share of private sector investment might actually stifle economic growth, is largely denied by her supporters. The myth that higher taxes necessarily leads to higher revenues continues. Economic incentives along with a loose tax code, provide the motivation necessary to bring about the opposite effect. The higher the tax burden becomes, the more effort that will be exerted to avoid paying the final bill. The other story that is taken as fact by many political enthusiasts, is the belief that the wealthy pay little to no taxes and as a class are far larger than actual statistics indicate. That the upper economic classes will alone, totally fund a vast new expansion of government expenditures is a total fallacy. 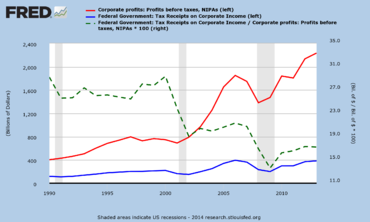 U.S. corporate effective tax rates fell from 29% in 2000 to 17% in 2013. The massive layer of new regulations and environmental rules that have been added during the two terms of President Obama, are unlikely to be reduced during a new Clinton Administration. Higher labor costs through minimum wage increases and medical compensations are inevitable. How business is supposed to thrive in this environment is unknown. Why companies would increase hiring in such a situation is just unrealistic. Hillary Clinton has promised to rescind any tax breaks for corporations that move operations overseas, in an attempt to stem the flow of jobs that are leaving the United States. This is particularly evident in manufacturing. That she will do this retroactively, increases investor anxiety towards companies that have made such moves in recent years. A further proposal is to enact an exit tax on any company wishing to move their headquarters abroad, in a process known as corporate inversion. Beyond more government spending and higher taxes, Mrs. Clinton has not defined any actual economic measures that she would take to move the economy back to more growth. The Republican nominee Donald Trump, has also been low on details on how to bring growth back to the American economy. He has stated that he will cut both corporate and private taxes to stimulate more investment throughout the economy. Corporate taxes in the United States are among the highest in the world at 38.9%. They were 39% or above over the past decade. Only the nations of Chad and the United Arab Emirates report a higher rate. Mr. Trump has stated his goal to reduce this level to 15%, to become more competitive with trading partners and the majority of countries. It is important to note that the effective rate that corporations pay is far lower, but the overall level does prevent the $2.5 trillion USD that United States companies hold overseas from being repatriated. Mr. Trump has also promised that he will somehow punish corporations that move jobs overseas. However, his feeling is with the new tax and investment policy this will become far less profitable to do this. Another campaign pledge is to lower personal income taxes as well, to promote more economic activity through consumer purchases and investment. The precise rates have not yet been provided. These massive tax cuts will at least temporarily inflate the federal deficit to well over $1 trillion USD again. Without accompanying spending cuts, it will push the American government further towards insolvency. Donald Trump is also offering a major public works program, twice the amount promised by Mrs. Clinton. The difference is, he wants it funded through the sale of bonds rather than through taxes. This is at least a partial recognition, that the government is running out of options involved with any new spending. Mr. Trump wishes to renegotiate all kinds of trade deals. This in itself may not sound like a bad idea. Nevertheless, such discussions can only be achieved over time and will be difficult. There was a great deal of give and take when these agreements were reached originally. Any punitive actions against trading partners will bring retaliation and could well incite a trade war. This would derail any jobs promotion, that may have been achieved through more global trade. More jobs in certain sectors may well be attained, but the cost to the overall economy will negate this advance with higher prices. Less trade will necessitate less choice and higher costs for all American consumers. It is important to point out, that both candidates oppose the Trans-Pacific Partnership as it now exists. In addition, Donald Trump has spoken of the desperate need to increase spending for defense. Although his argument may be correct as far as maintaining the security of the country through more military expenditures, it is not clear where the extra money will come from to pay for it. As the campaign for President heats up on both sides, the focus of the mainstream media continues on issues that has little to do with the majority of Americans. It provides a distraction to the two main issues facing the citizenry. These are the economy and security. They are closely related. It will be difficult for the global economy to prosper, as the world grows more insecure. Neither presidential candidate to date is being forced to present a coherent detailed plan, how to reinvigorate the American economy. Without a return to more robust growth, the outlook for the United States looks far more grim both at home and abroad. Future investment both domestically and internationally will be dented, as terrorism and instability spreads further around the globe. The headwinds that can subvert growth, are expanding at an alarming rate. The list of nations that are nearing or entering recession continues to enlarge, putting further pressure on the economy of the United States.